As the Women’s Six Nations draws ever closer, Lucy Lomax speaks to England winger Jess Breach about her return to the 15s game, playing for Harlequins and what it’s like to live out her dream of being a professional rugby player. In a relatively short space of time, Jess Breach has become somewhat of a household name in women's rugby. Not only did she score six tries on her international 15s debut against Canada in 2017’s autumn series, but she has continued to achieve, firstly by being offered a professional sevens contract back in September (winning a Commonwealth Games bronze medal in April 2018) and now the 21-year-old has made the switch from sevens to sign a professional 15s contract along with England veterans Emily Scarratt and Natasha (Mo) Hunt. “It was nice to have Scaz (Emily) and Mo switch back over at the same time as me, it really helped with the change.” she said. 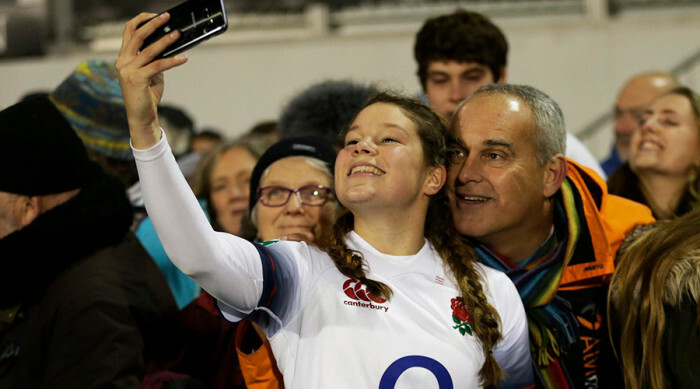 Part of the reason for the the pacey winger to switch, was the pull of England Rugby’s professional contracts entering the sport for the first time, and perhaps the knowledge Harlequins, her club, were waiting with open arms. Quins lost at the death two weeks ago at Allianz Park after being 16 points ahead heading into the final five minutes. “A lot of hard work has come out of the Sarries defeat and we righted a lot of wrongs at the weekend against Richmond," - a match was that watched by 1,249 people at the Twickenham Stoop with Breach scoring a hat-trick of tries in the process. With only three regular season games left in this season’s Premier 15s, Quins are guaranteed a play-off spot but there’s still plenty to play for to secure a home semi-final. I finish off the chat, inevitably asking about how it feels to be a contracted player and a full-time professional. “It’s phenomenal, I feel so privileged. The first few days in camp after the squad was announced was like the first day in a new year at school. Some players are still trying to find their feet a little bit with the extra free time they have! “Obviously most of players, except the ones like myself who came from the sevens programme, have always had to fit training and gym around their day job, fitting it in in the early mornings or evenings and now they obviously don’t have to do that, so it’s a bit of an adjustment period. If you want to watch England play in this year’s Six Nations, tickets are still available for England v Italy at Sandy Park on Saturday 9th March and admission is free for spectators to watch England v Scotland at Twickenham Stadium after the men’s game, on Saturday 16th March.